You’ve seen the blog posts. You’ve pored over the books. At one point in my career, I was firmly in the specialist camp. I didn’t start out that way. I really wanted to be a generalist and translate, well, anything! But after much thinking that the experts must be right, I dove into hard-core medical translations. This helped my business a lot, but “specialist” was never the whole story to how I made money. 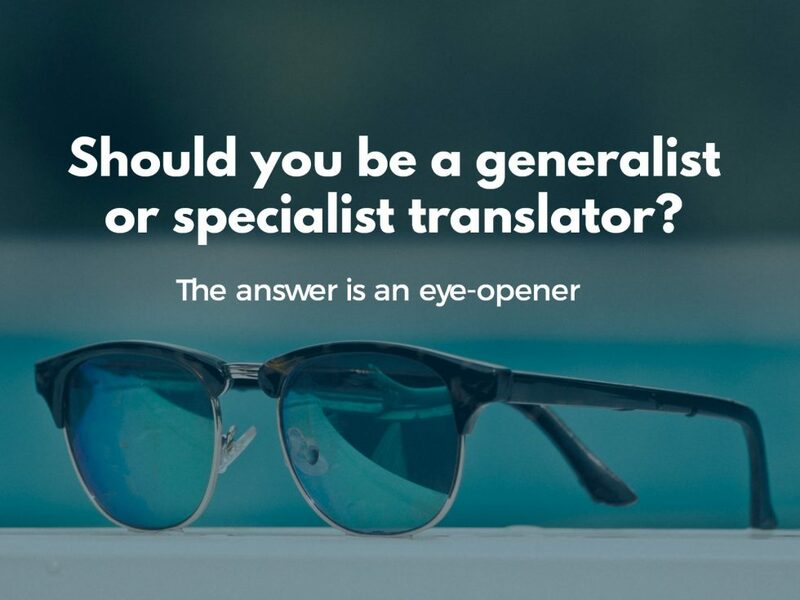 In fact, I’ve learned that “specialist” and “generalist” is a false distinction, and one that actually isn’t very helpful for freelance translators. Let’s look at the potential problems with each end of the pole and see if we can come up with a better option in the middle. As a freelance translator, you are generally not going to be a true specialist. The only way to really be a specialist as a translator is to have one client who pays you to know their industry inside and out and lets you come to their work meetings. Indeed, in-house translators need to be specialists. They work on specific types of texts for specific clients. Ergo, they specialize. But a freelance translator? You have to work with all sorts of companies and sectors. You don’t have the luxury of delving too deeply into one area. Imagine if you said, “Hey, I’ll only translate manuals for horse-drawn buggies. That’s a good specialty to have as everyone needs a horse and buggy.” Until a new-fangled machine called the “horseless carriage” comes along and ruins your business! 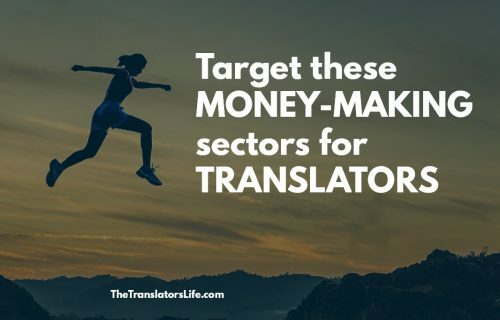 Specialization or a true “niche” in this sense will make it very hard for you to start as a translator and to keep your business afloat. Personally, I have found these problems in specialist translators too, but they do tend to crop up more among generalists who haven’t taken the time to get to know their sectors. To be a successful freelance translator, you want to harness the best of both worlds. In other words, you want to focus on a few sectors so that you know them very well and can produce good translations — but without going so deeply that you can’t take your business in a different direction if the worst happens, i.e., an economic downturn, Zombie apocalypse (i.e., the usual). My first piece of advice is to not worry about the whole generalist-specialist thing. Your translation business is going to be a lot more fluid than that, so there’s no reason to put unhelpful labels on these things. In this phase, you leverage all of your passion, skills and education to translate in areas that make sense to you. Did you have a part-time summer job at a factory? Then you might have enough knowledge to translate manufacturing texts. Did you work at a payroll company for a couple of years? Then tell everyone you know that you are interested in translating human resources texts. Do you have every single issue of Scientific American? Then take any science text that comes your way that makes sense to you. At this point, you may want to decide that you are not doing legal or financial texts because the bore you to tears. Once you have that first series of contracts under your belt, you’ll start to get a feel for the texts you have a passion and skill for. You can start developing terminology databases for specific areas and get to know the jargon in those fields more intimately. You’ll start to keep track of your best-work portfolio for the areas that you love so that you can attract companies in those sectors later on. The goal in this stage is to lean towards some sectors and not others. You do business texts, but not marketing content. You do environmental science, but not FinTech or robotics. You do technical communications, but not engineering specifications. In this stage, you have a body of work in a few core sectors that you call your own. I tend to call myself a “communications translator,” as I work pretty much only for communications teams for the public sector, non-profits and marketing teams. But this isn’t something I set out to become. It was something I became from the experience and expertise that I developed over the course of many years. It’s helpful so that people understand what I do without putting an unnecessary label on my practice. Freelance translators are almost by definition generalists–at least compared to our in-house counterparts. We can focus, but it is so rare to focus so much that you only work on a specific type of text for a small number of companies. The freelance translation market just doesn’t have enough supply for that. Instead, you’ll be a generalist who slowly gains a narrower focus over time, with experience. You don’t have to worry about specializing. You can just worry about becoming the best translator you possibly can be.